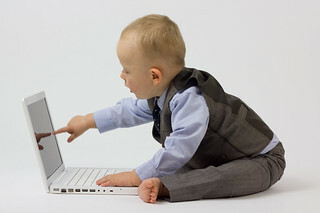 A cute baby boy is dressed in smart business clothes and is with his laptop ready for work. Studio shot Isolated on white. As always, these images are completely free to use in whatever application you wish, as always, a link back to www.visioncreation.co.uk would be nice, but not necessary, but as a thank you, please visit the website, scroll to the bottom, and click like/tweet/+1 etc etc, that would be awesome! Thank you.